As well as familiar animals, extinct or not, as scapegoats, we also find supernatural scapegoats. I’m going to look primarily at werewolves but with a side of vampire and if you’re interested in finding out more about non-animal scapegoats, just take a look at the history of witches. Whilst I’m focusing on werewolves, it’s important to note that different were animals exist all over the world, generally using the local apex predator as the beast in question. So we find weretigers, werehyenas and werebears accordingly. But the werewolf was the European version of this monster. Were means man so werewolf just means man wolf. But wolves themselves can be scapegoats. We see them as devilish, as destructive and as causing chaos. They are mysterious, unknown, uncontrollable and a threat to humans. They have also come to be associated with sexual drive, sexual predators and as wild and untameable. All traits which society doesn’t tend to like, today or in the past. Monsters, including wereanimals, chart our history of fear. They act as vessels to place all our worries and fears onto. Like we saw with the badger, it is easier to have a physical, identifiable thing to use as a scapegoat than it is to live alongside an unknown, unseen monster. We are terrified of not being at the top of the food chain and apex predators make this threat real and thus wolves and hence werewolves become our enemies. Werewolves and other wereanimals in particular seem to pose a particular threat because they can move between the civilised society of humans and the wild world of the wolves. This creates unpredictability, uncertainty and distrust at a time when fear of the unknown was already rife. In addition to transcending the two halves of the world, werewolves had the addition image problem that the wolf part of them was untameable and hence the werewolf could not guarantee the containment of the beast inside them. This all echoes a war between instinct and rational, blurring the lines between man and nature at a time when a strict hierarchy was in place. Lycaon himself ran in terror, and reaching the silent fields howled aloud, frustrated of speech. Foaming at the mouth, and greedy as ever for killing, he turned against the sheep, still delighting in blood. His clothes became bristling hair, his arms became legs. He was a wolf, but kept some vestige of his former shape. There were the same grey hairs, the same violent face, the same glittering eyes, the same savage image. Then in around 10th century France we see the tale of little red riding hood which casts the wolf as evil, and in some tellings the wolf is actually a werewolf. A little later, in 1180s, there is an account from Gerald of Wales about werewolves in Ireland, which included the first known record of a female werewolf. And also in the 12th century, we have a tale from Marie de France about a werewolf. However it seems to be around the 14th and 15th century that belief in werewolves took hold in Europe and with it, the idea of the bloodthirsty, ruthless killer who murders for pleasure not for food. Following this, in the 16th century, we find evidence of werewolf trials. These were blatant persecutions of the “other”. Monsters often live at the edge of society, close enough to pose a threat but not so close that people see them as human. This meant that a certain type of person was more at risk of werewolf accusations. People who were a drain on the village or town were also vulnerable, especially during times of famine and economic difficulties. Old people and disabled people were at risk, as were outsiders who had no emotional connection to the locals. If you don’t have enough food for your own family, you don’t want any going to the stranger who just rocked up and wanted his share. As well as a way of scapegoating outsiders, werewolves acted as projections of the inner beast*, projecting your fears about yourself onto someone or something else. The behaviour of werewolves was considered to be animalistic and this unhuman behaviour in itself was to be feared and not tolerated. Remember this was a time when humans were trying to control everything around them – we had the witch trials, animals hanged for murder and pests taken to court for eating crops. In addition to the fear of the uncivilised wolf, the werewolf has the added danger of being part human. They inhabit a liminal space between man and beast and act as a reminder of how close we all are to animals. Being neither man nor beast, yet belonging to both, the werewolf traverses boundaries without any consequence and hence traverses the law. 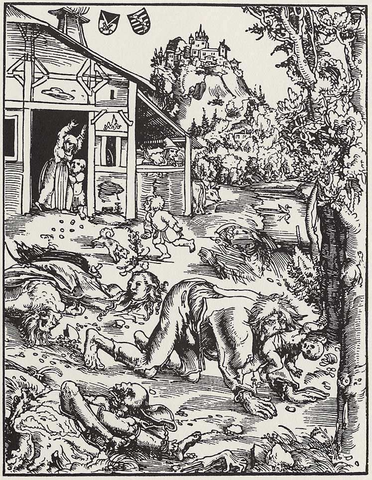 Werewolves of Poligny, 1521: The account of this was recorded 70 years later so isn’t great from an evidence point of view. During this trial, 3 people were accused and tortured. It was said they had magic salve from Satan which turned them into wolves. Sympathetic wounding, where the wound on a werewolf matched that of the man, was used as evidence. Giles Garnier, Burgundy, 1573: Something was kiling sheep and children and permission was given to citizens to kill the beast. Garnier was an outsider, he was disliked, had an unpleasant manner and was poor. Essentially he ticked all the boxes for a scapegoat. Claims were made that the wolf looked like Garnier and he later (presumably under torture) confessed. He claimed that a spectre appeared and offered him a cream which would transform him into a wolf and make it easier for him to hunt. As Garnier was struggling to provide for his new wife he took the cream and went on to murder at least four children. The first alleged victim was a 10 year old girl that he strangled. He then removed her clothes, ate some of her flesh and took some more home to his wife. The next attack was interrupted by a passerby but the girl in question had already been injured and went on to die several days later. There were also attacks on boys and Garnier was found guilty of crimes of lycanthropy (werewolfism) and was burned at the stake. More than 50 witnesses claimed to have seen him carrying out his heinous crimes. Over time, the idea of a werewolf became one more like a psychological illness. There was this idea of having fur on the inside so that whilst someone could appear human, they were really living by wolf instincts. This, from a scapegoat point of view, meant anyone could find themselves labelled as a werewolf. In particular, outsiders, people who didn’t fit it and people who might be a bit odd could find themselves in trouble. A lot of the motivations and concepts behind vampires are the same as those for werewolves and other monsters. They are blamed for misfortune and for terrorising people however they have undergone more transformation over the years than the werewolf. In the early days of vampires, they weren’t blood suckers, that came in the 19th century, and the main fear was due to their immortality. They inhabited the borderland between life and death and that terrified people. They weren;t the handsome and charming creatuers of Bram Stoker’s novel, they were filled with disease and pestilence and thus posed a seemingly real threat to people. These vampires were said to kill people by spreading illness. Again, we see trials surrounding alleged vampires with various forms of evidence. Some was around a lack of expected decay in the corpse and another form of evidence was that an unnatural amount of people got sick shortly after the vampire had died. Obviously there had to be reasons to suspect a vampire before you dug up a corpse. Accusations tended to follow when there had been an unusual amount of death. This made people nervous and they needed something to blame it on so that then it could be controlled. The corpses became the scapegoats. This also meant that vampires became associated with the plague, and hence with rats and pests. Within these trials are a number of other themes; the dead person often died young and unexpectedly in a violent way, they were disliked in life, a high number of ghost sightings after their death, growth of hair and nails, blood at the mouth of the corpse and “wild signs” (an erection). Bodies were dug up to check for evidence and if a vampire was suspected, a stake was put through them to pin them to the ground or the corpse was burnt. Then, with the publication of Dracula in 1897 we saw a very different kind of vampire popularised. This vampire was an outsider at a time when people were starting to move around a bit more and Stoker probably used this to prey on people’s fears and unsettled feelings. He was also hard to spot, being a well dressed man who was a successful seducer, not at all what you would expect from a vampire if you were familiar with the older versions. This contributed to the popular image of the vampire as intelligent, clean and well turned out. Apparently it was also Dracula which solidified the association between vampires and bats although it had been around as an idea previously, Stoker just made it more popular. The modern vampire appears deceptively human and yet they are without a soul, who knows what they will get up to.. They are still repeatedly cast as other, such as foreigners or sexually deviant creatures but are now more likely to brood than disgust. *This way of projecting the dark parts of ourselves onto others is something that Jung calls the shadow self and is an interesting topic of its own.